The ULI Hines Student Competition is an urban design and development challenge for graduate students. 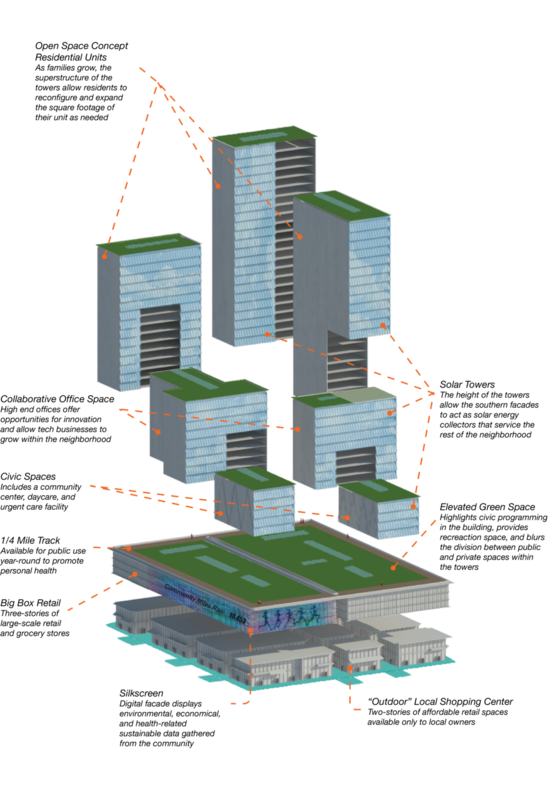 The competition engages multidisciplinary student teams to devise a comprehensive development program for a real, large-scale site. Teams of five students representing at least three disciplines have two weeks to develop solutions that include drawings, site plans, tables, and market-feasible financial data. All graphics are my own work unless otherwise noted. Midtown Circuit is a healthy, innovative community where the technologic, artistic and civic-minded residents of Atlanta come together to build a brighter future. Posed as a central node in the burgeoning multi-modal circulation system of Atlanta’s metro area, Midtown Circuit offers an environment where residents and visitors are empowered to make healthy choices. The neighborhood is built on the concept of perpetual change, where the built environment can accommodate the changing needs of the businesses and families that call the community home. Similarly, the built environment reflects the health of the community, using technology to artistically communicate environmental and social achievements and goals. The journey begins to the east connecting the North Ave Streetcar, bike lines on Ponce De Leon Ave, and the North Ave MARTA station to the development proposal. The metro station provides a public park with native tree and shrub plantings neighboring the historic Station 11 and a new hotel. The walkable development progresses toward the west across integrated complete streetscapes, which provide shaded sidewalks and prioritize pedestrian right-of-way. The park-like environment extends south and north to the Bank of America and AT&T Building street frontages. The Hub, Midtown Circuit’s largest mixed-use development project acts as the motherboard for the community and the most striking vertical way-finder. The street front retail on Ponce De Leon Ave and Spring Street provide ample space for local businesses to take root including a local grocery selling fresh produce. The Hub also harbors open building concept style residences with floor plans that can change and grow in square footage to meet the needs of the owner, as well as a childcare center and a ¼ mile public running track. This intelligent building harvests solar power on the southern facades and uses roof gardens to retain and filter water. The building also contains a Silkscreen, or digital façade, that displays real-time energy and water usage in the community as well as information such as ‘community miles run’ to promote public awareness of all aspects of sustainability. The concept of adaptability crosses the street to the lab and office facilities that border Georgia Tech’s Technology Square. These lab spaces are modeled to grow with the startups and mixes technology and art providing open access studios and prototyping spaces. 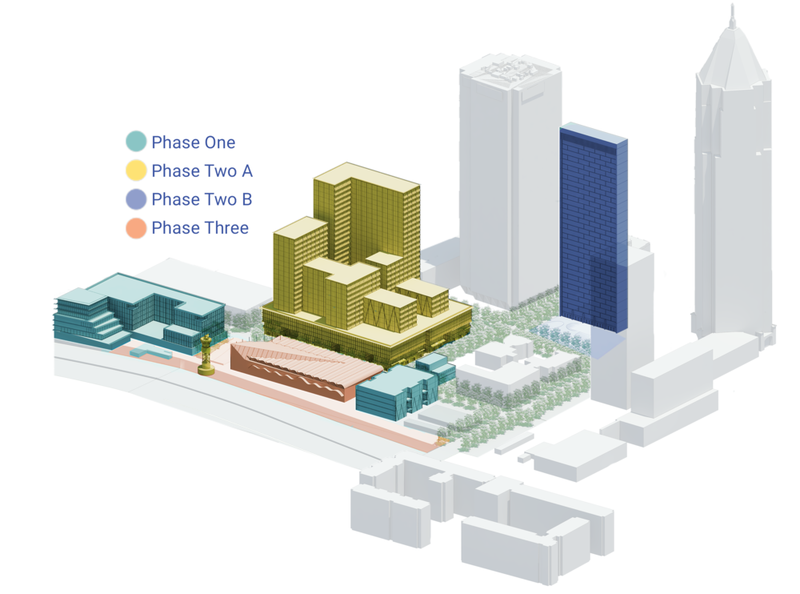 Midtown Circuit phasing will begin by connecting to the existing Technology Square by extending its corridor to the south with flexible Wet/Dry Lab office space. This office space will act as a financial stepping stone to the high density mixed use project proposed as “The Hub” of the development. The larger deal dubbed “The Hub” will contain close to 2M SF of mixed-use areas to create an elevated level of convenience to all of the residents. With over 900 residential units, 200K SF of office, 40K SF community center space and retail at the base of the building “The Hub” will serve as an example of community high-rise living. We have allocated and encourage The Partnership to include twenty percent of all residential and retail units in key locations as affordable housing and retail to boost equitable growth in the City of Atlanta. In return, The Partnership would structure leases to absorb the Work Opportunity Tax Credit from local retail tenants and give jobs to over 200 employees in the development. Construction loan payments will be decreased by subdividing construction into phase II.A. (The Hub) and II.B. (North Ave. Marta Station Park and Hotel). The hotel will provide crucial accessibility to the existing MARTA station by purchasing the air rights above the station and leasing the ground floor from The City of Atlanta. With cooperation from the city, additional exit points could be incorporated around the adjacent street corners of North Avenue Station. During phase II The Partnership would reclaim the impervious surfaces of the MARTA station and extend the urban design elements across West Peachtree toward the All Saints Episcopal areas. This urban design scheme will make “The Hub” community more accessible to the public and improve quality of space, maximizing the tax credits provided by the Community Improvement District (CID). Finally, the value of properties will be solidified by the inclusion of a Civic/Cultural Center that will foster heritage and engage the community as a whole. The west edge of Midtown Circuit celebrates the legacy Olympic torch as a focal point for community awareness and a beacon for the community’s largest park. 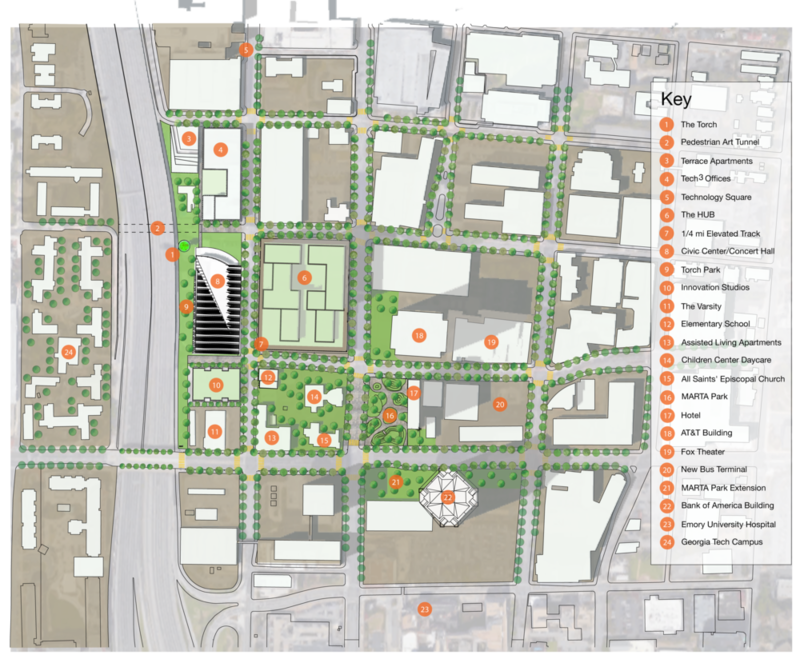 Torch Park runs between the Civic Center and the Downtown Connector uniting William’s Street with North Ave at The Varsity via pathways, recreation space, gardens, and bike paths. The development is seeking LEED Platinum certification, but the intention for sustainability does not end there. The community offers a holistic approach to new development in Atlanta. It recognizes the need for continuous, visual community engagement and spaces that can change over time to incorporate new technologies. The development’s foundation is community involvement, which will ensure the community continues to grow, produce new ideas, and provide safe, healthy spaces for the people of Midtown to call home. Later stages of the development could include a new elementary school and additional mixed-use retail and residences in neighboring parcels.